the Chinese design is associated sometimes with copies of the western originals. 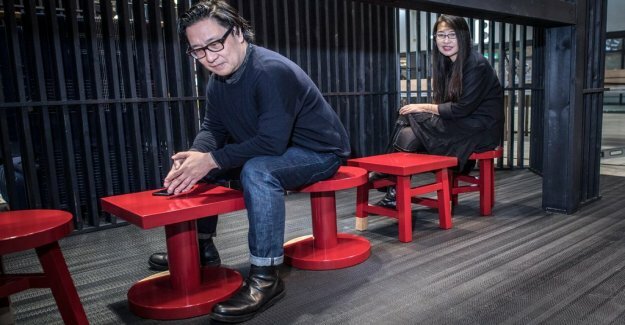 But the chinese design duo Neri&Hu is touring around the world on their own merits. Prior to the Stockholm furniture & light fair, they have been in Toronto, Hamburg, Copenhagen, Tel Aviv and Milan. Last year, they received 400 inquiries about the project, but said yes to fewer than 15. They will be delayed to the interview on Monday morning on the grounds of Stockholm's snow-covered streets and says that they have been concerned since the arrival. A box with things that would be exhibited in their installation were left in Shanghai and now they have been forced to contact the people on the way here to ask them to take with them different things. dissatisfied with the ongoing construction of their installation, which is still in progress. – We first became quite upset yesterday when we got here and saw that this design was not so good. We came from China and thought that it would be built better in Scandinavia, but then we realized that when you only get four or five days to construct a building, you have also created the chinese production conditions. Do you understand? says Lyndon Neri and laughing. – So what determines the quality of the construction is not really so much about the construction work will take place in the east or in the west, but how much time you get for the build. If anyone gets some time in the united states, the united kingdom or Italy, it becomes also bad.
" Yes, but it is also about other things than the construction industry itself. In China, it is not so much bureaucracy. Have approval from the proper authority, it is just to snap with the fingers, while there will be very many meetings, if you are going to do something in for example London, " says Rossana Hu.
" I think it is important with balance. When you come to New York can end up in meetings with 13 different consultants: golvexperten, mattexperten, the acoustic expert and they all say that they have to wait for a particular sketch. So it goes round and round. In China, the opposite applies: There are no consultants so you get to do everything yourself from the beginning, " says Lyndon Neri. ”The unfolding village” in stockholm international fairs ' entrance resembles a large, unfinished husskelett with transparency between the wooden beams. The interior is designed as a winding road and a long street where each room could be a narrow dead end, at the same time as windows and transparent walls dissolve the border between outside and inside. The idea is that the design is reminiscent of the street life in the traditional chinese village. – This is a representation of the cultural relic consisting of the village life. You hear whispers, chit-chat and gossip, you see people in the streets talking with each other. The house is falling apart so that there is no longer any boundary between public and private, " says Lyndon Neri. China is falling with about 300 pieces per day. In the year 2000 there were 3.7 million villages, and today the number has shrunk to 2.6 million. Masons and farmers takes on the more well-paid jobs as drivers or gatekeepers in the towns and when they move, they leave their baby behind in the countryside with the grandparents. – the Result is an extremely dysfunctional society. The family is dissolved and the parents meet only their children once a year, during the chinese new year. People will not be happy in the situation, says Lyndon Neri. – Mormödrarna and farmödrarna don't have time anymore to chat because they need to take care of the grandchildren. They must now take the kids to and from school and meet a lot of other duties. So the lanes have suddenly become very quiet, says Lyndon Neri. – Progress requires, very often, that something is sacrificed. Nothing moves only in one direction. Whenever there is something positive there is also a downside. And this is one of those inevitable things with modernisation. It takes place not only in China, but China is undergoing this modernization at an unprecedented speed, " says Rossana Hu. three miles of wood, a material that Neri&Hu think about but that is very rare in China.
" I love that you guys in Sweden might use wood as a natural material. If you are going to build sustainably in China, one may instead use, for example, bamboo. We also try to use a lot of bricks that we buy cheap from demolition projects, " says Rossana Hu. the villages of rural areas are disappearing also important parts of the chinese cultural heritage. Neri&Hu has decorated his house with several elements that highlight the characteristic elements of the village life. A rug shows the pattern of the cobblestones and tiles. A large ceiling lamp in painted red bamboo is shaped like a mobile kycklingbur. Other lamps are designed as chinese lanterns. A cabinet rests on a metallvagn as in the villages used to carry ceramics and pottery to the kiln. – 80% of buildings in rural areas are historically and culturally significant. Some historians believe that if the rural cluster of buildings representing the folk, the confucian ideals will disappear, at the same time that family structures are broken, so die, large parts of the chinese culture, " says Lyndon Neri.
" My answer is: absolutely not. When we started our agency, I thought that we would be able to change the world. I had so much energy. But the economic interests are so powerful and they don't give a damn about design or creativity if it does not give them money. They want to have residential buildings designed by good architects, simply because they then can charge more. I'm depressed, I have previously tried to create change but have with time, realized how difficult it is, " says Lyndon Neri.
" a year ago we were in India and saw Le Corbusier's and Louis Kahn's masterpiece in India. They made their buildings there for 60-70 years ago, and when I realized how little has happened in architecture since I was so depressed that I thought that we could just as well put down our agency. But then when I went on to other countries and saw more buildings, I changed the me: maybe we should continue anyway, for 98 per cent of the world's house is still really ugly.